The SubscriptionBoss plugin acts a gateway between your PayPal account which takes the payments and the Infusionsoft billing system which manages your customers and generates invoices. 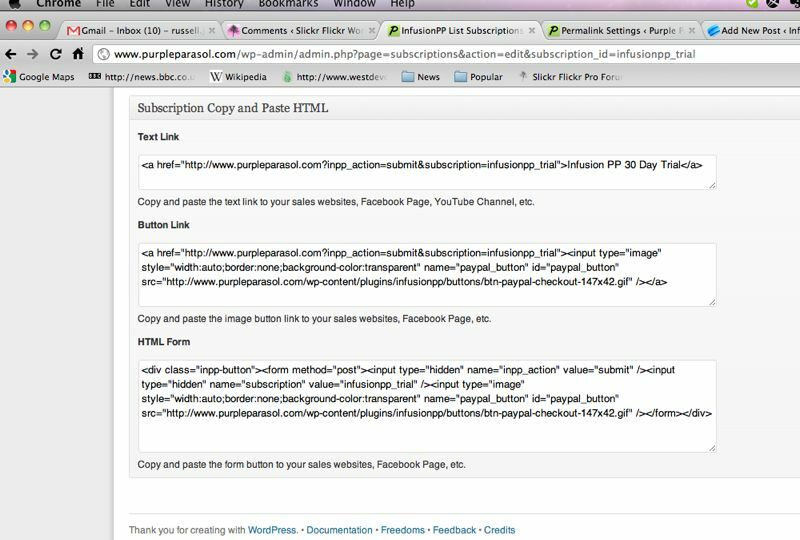 SubscriptionBoss comes with the SubscriptionBoss short code with makes it easy to insert a PayPal button on the site. However often you want to initiate your sales process on another location where neither WordPress nor the plugin is available. In this case you need to resort to HTML. To make your life easier the Edit Subscription page has a HTML Helper section that makes it easy for you to copy the HTML for links, buttons and forms and paste it into your sales sites. The main location where you will use text links is on YouTube in the video description. The video will sell the benefits of your product and the link immediately below the video allows your audience to go straight to PayPal to make the purchase. The text link can also be used in an email signature, a forum signature, a tweet or a facebook status message. But due to limited space (a single line typically) your offers need to be compelling and time constrained for it to be effective. For example, “Buy using this link in the next 60 minutes to get product X for $10. That’s a $89 saving!”. If this communication is about a product that the audience already knows or they trust you it is likely to be much more effective. Button links will be placed in your sales copy which can be in a HTML email, a web page on your sales site, or a Facebook fan page. This just is a standard ‘Buy Button’. HTML Forms can be placed on your sales web site or on your Facebook Fan Page (on the extra info tab). You would use the form when you want to collect more information from the user. Typical example would be product options, a username or password, buyer age, gender, interests, etc. In this case just add the input elements to collect the extra information between the form tags. When doing this, you will also need to set up SubscriptionBoss to handle the extra fields: on the Edit Subscription page, add the form fields in a list in the ‘extra keys’ area with the correct names so they get passed through to infusionsoft.